High-sensitivity GPS marks and stores 1,000 waypoints and 100 tracks. Marks your favorite locations to easily navigate back to them. Garmin SailAssist™ for GPS 73 includes virtual starting line, heading line, countdown timers and tack assist. Sunrise/sunset, estimated time of arrival, other calculations and marine data. 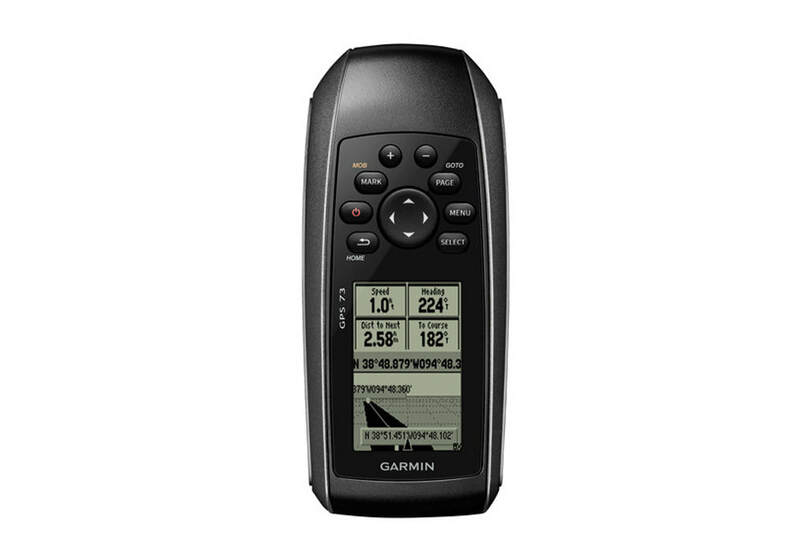 Built-in backlight.This easy-to-use handheld is the perfect navigational solution for boats, sailboats or small watercraft that do not have a chartplotter. It’s also ideal as an important emergency navigation backup for all vessels. Its high-sensitivity GPS marks and stores 1,000 waypoints and 100 tracks so you can navigate right back to them. Use on land or water — it floats! Features SailAssist, including virtual starting line, heading line, countdown timers and tack assist. Quickly Acquires SatellitesHigh-sensitivity GPS receiver quickly locks onto GPS signals and tracks your location even in challenging locations, such as deep canyons or under heavy tree cover. Mark Important WaypointsWhether it’s a hot fishing spot or a lobster pot, you can mark and store 1,000 waypoints and 100 tracks to navigate to and from time and time again. SailAssist: SailAssist helps you sail more effectively with heading line and tack assist. Tack assist lets you know when to tack based on whether your boat is getting headed or lifted compared to the boat's optimal tacking angle. For those who like to race, there’s virtual starting line and countdown timer to make sure you cross the starting line at the right time. Store Important DataGPS 73 is NMEA 0183 compatible. To transfer data to your device, it easily connects to your computer via USB. If you're into boating, hunting or fishing, you can use the built-in celestial data, which includes sunrise/sunset times and a hunting and fishing calendar, estimated time of arrival, other calculations and marine data. High-contrast DisplayGPS 73 has an intuitive user interface with dedicated back-lit buttons for quick and easy operation. Its high-contrast display makes it easy to read in all lighting conditions.